Former Gunner Cesc Fabregas admitted that Chelsea were boosted by Arsenal’s draw against Manchester City ahead of their afternoon kick-off against Swansea. Five Things We Learnt Premier League: Five things we learnt from the Premier League this weekend. 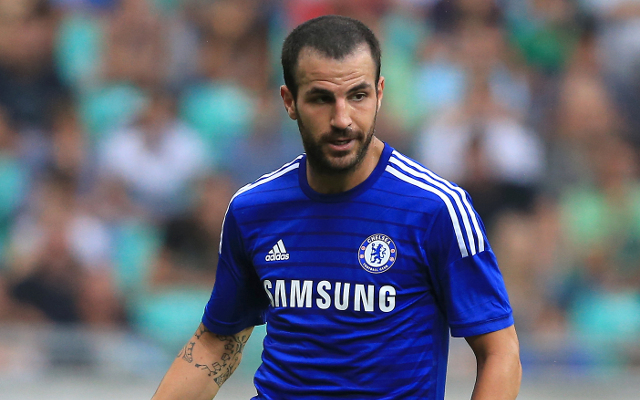 Mourinho Hails Fabregas And Costa: Jose Mourinho hails Cesc Fabregas and Diego costa dream team. Chelsea Sign Wonderkid: Chelsea on the verge of signing £2.3m wonderkid. Arsene Wenger’s Arsenal were pegged back after taking the lead at the Emirates in Saturday’s early kick off, and then had to hold on for a 2-2 draw against the Premier League champions. Jose Mourinho’s Chelsea were buoyed by the news that two of their biggest title rivals played out a hard fought draw, spurring them on to a 4-2 victory over Swansea. “Obviously we wanted three points as usual, but the more we take advantage of our rivals the better,” Fabregas told Chelsea’s official site. “I feel comfortable, I feel good, I feel happy,” he added.